Tony Trott, who died on 17 February 2017 in his 91st year, taught English at King Edward's School from 1950 to 1987, and was the School's Head of English from 1952 until his retirement. Old Edwardians lucky enough to have benefited from Tony's teaching have plenty of stories about him: below are some of the memories of him that have been shared with us since the news of his death was announced, along with Tom Hosty's Funeral Address. Let me begin with those whose loss is the greatest. Tony loved his family profoundly, and I have no doubt that, however wonderful he was to have as a friend, he must have been every bit as wonderful to have as a husband and a father. He was very proud of Nick and Helen, and spoke of them not only with affection but with admiration and respect. Doris was the beating heart of his life: whether having picaresque scrapes together in Italy or entertaining guests with a perfect synchronicity of effort, whether mulling over books and music or keeping track of the evolutions of their immense network of friends, the two of them always seemed perfectly easy together and at one. There was no mistaking the pride with which he spoke of her, or the strength of the bond between them. Most of us here today have lost, in Tony, a friend. He had troops of friends, accrued over a lifetime: some started as pupils, some as colleagues. He kept in touch, carefully and actively, with all of us: I remember being awed by the banquet at Highbury Hall which was organised to mark his retirement from teaching in 1987. So many people, in so many walks of life, and all of them bound together by the magic thread of his interest, encouragement and sympathy. The nearest I ever came to seeing him in tears was at that meal, as he remembered in his address various ex-pupils and old acquaintances who could not be present because they had died. All of us, Tony's friends. Quite probably, many of us who have been remembering Tony since the sad news arrived have been remembering him laughing. He loved to laugh: he had a small boy's relish for mischief and subversion and a raconteur's ear for "good stories". Many of those stories were richly self-deprecating; many involved the ironic undercutting of pomposity and self-importance, or the accidental unmasking of falsehood; time spent with Tony was always likely to involve episodes of the hilarious, and I am sure that we will be telling each other "one of Tony Trott's stories" for years to come. But the preciousness of his friendship was not simply a matter of good stories. He was, quite simply, one of the kindest men I have ever met. He subscribed, absolutely, to the Christian maxim that charity and kindness are to be performed, not talked about, but I am certain that there are people in this church today who could testify to Tony's practical help and support in times of trouble, his sympathetic ear, his willingness to offer the help we needed when we needed it, without judgement or ostentation. His years of work as a Samaritan during his long retirement should not be forgotten: it is very difficult work to offer sympathy, to listen, to "be there" without an irritable reaching after solutions to the problem, without dishing out advice based on one's own preconceptions. But I can easily imagine that he was very good at it: he recognised the authenticity of unhappiness, its "mystery" if you like, and understood well the limitations that govern our ability to put things right. He was deeply interested in people, of course. That is what won us all over, sooner or later. Even when he was marking the work of his English pupils at King Edward's School, he treated each homework as the expression of an individual personality, of a person. I wrote a sentence for him when I was 14 in which I worried about the deterioration of my eyesight: Tony took the time to write a couple of reassuring sentences explaining that this process frequently slowed down as a chap reached his late teens. Some of his pupils who have gone on to be successful writers, academics and journalists have acknowledged that it was Tony's perfectly matter-of-fact seriousness about their abilities which first reassured them that they had any ability. Whenever you met Tony socially, he would be up-to-date on the latest developments in the lives of other members of the network in whom he thought you might be interested; in due course, your news would be passed on too. Because he was so unfailingly curious about us all, about our careers, our reading, our achievements and our troubles. No wonder that we loved him. I'd like to speak for a while about Tony as a teacher of English; partly because that is the trade in which he laboured for the best part of forty years and revisited from time to time after retirement; partly because it is how I first came to know him; and partly because his life as a teacher is inseparable from the man he was. He was a very good teacher because he understood the need to help his pupils to think and to live. The man was his own best lesson: on the one hand courteous, scholarly and generous; on the other, consistently unforgiving of lax thought, reliance on stereotypes and limited knowledge, and (the worst of all the schoolboy sins in his book) not being prepared to make the effort. He was the most encouraging of teachers. He listened carefully to what you had to say, and paid you the compliment of taking it entirely seriously, as if you were another adult: if what you said was callow or foolish, he would gently ask a couple of questions chosen to lead you in the direction of a re-think and leave you to do the spadework later. When marking pupils' written work, he always treated boys as thinkers and writers: maybe, in some cases, desperately bad ones, but engaged in the same struggle to say something worthwhile in a comprehensible and elegant way which lay behind his own writing. He was always looking for the scholar, the poet, the journalist or the novelist who might be curled up, almost invisible, in any unpromising chrysalis. Jim Grant, better known these days as Lee Child, relates his difficulties in making the jump from O-level to A-level work in the mid-1970s. It was for many a ticklish transition, from learning and regurgitating the answers to building and supporting a case of one's own. His first History essay came back with 4 out of 20; his first English essay from his other English teacher came back with 6 out of 20. Life seemed pretty black for one new A-level pupil. Then came Tony's first essay: 17 out of 20, with lots of detailed praise on the end. Jim realised, much later, what had happened: Tony, who had known him for about a week, had spotted that this pupil badly needed to believe in himself, was already beginning to drown in disappointment and baffled rage. So he set out to find everything - anything - at all promising in that crucial first essay. It worked. Jim felt, as he puts it, "empowered, included and valued": by the end of the year he was doing well. For Tony, helping his pupils to find that inner scholar, poet, journalist or novelist was what mattered the most. Tony himself said to me a couple of years ago that he thought that his popularity with the boys of King Edward's was largely down to irony. Schoolboys in the 1950s and 1960s, he thought, were not used to encountering an ironic view of life in their teachers, and when they met it in him they liked it and responded to it. I wasn't entirely sure at first that I understood what he meant. He certainly wasn't talking about sarcasm: if Tony thought you were in danger of letting yourself down by being an idle slob, by refusing to think, by ducking the necessary work of growing up, he would tell you so man to man. Yes, it's all right, you say, all right. Yes, it's not bad, you'll say, not bad. But "irony" is not just a verbal technique: it is a way of apprehending life. We need to be aware of our limitations: for one, our weakness for oversimplifying the world, oversimplifying people, in order to have a smoother ride. Half of what we know isn't true; half of our understanding is a mish-mash of unexamined assumptions and conclusions reached by jumping. Just when we fancy a nice drive in the country, that is when life has a way of sneaking round the back way to let our tyres down. Some boats come home that are not steered; and the whirligig of time brings in his revenges. Our task, as grown up people trying to lead lives worthy of grown up people, is not to settle for the soundbite, the rule-of-thumb or the sentimental truism, but to do our best to make our understanding of each other, and of the business of living in which we are engaged, more capacious and more subtle. This is what Tony was always doing his best to teach his pupils. For him, literature was no mere grace-note to the civilised life; it was a vital and central part of being human. It mattered so much because it is through literature that we are given the opportunity to understand what it is like to be somebody else; to lead a life which is perhaps profoundly different from our own; to live in a place and time where the rules and the challenges are unfamiliar. Thus, we are given the chance to expand and subtilize our understanding of what it means to be human, and, in the process, to become more human ourselves. As Tony said in a lecture given to IB Literature students at Dartford Grammar School in 2009: "Confrontation with what is unfamiliar should make us examine and possibly question what we take to be ...normal. Perhaps our complacent certainty that we know what progress is may not be as infallible as we think; and perhaps we're not so damn smart after all." We have not lost the values which Tony cherished. A robust contempt for the distorted language used by wealth and power to mask their agendas; a distrust of the glib and the too-good-to-be-true; a generous curiosity about people and their lives; a sense of the bottomless complexity of the world and a love for beauty in all its forms; a determination to be properly adult, to be properly human: all of these, and many more, go on. Tony made no negligible contribution to their continuance. What we have lost is a good, true friend. Of all the losses which we can sustain in our lives here, that may not be the greatest. But it's up there. For now, it will do. We were studying Auden for O-level Literature: "Lay your sleeping head, my love..." it was. One of the class had unearthed the fact that Auden was gay, and noticed that the poem contains no gendered pronouns. For Fourth Year boys in 1970, this was pretty explosive stuff. "Are we studying a homosexual love poem, sir?" came the question, and we waited for Tony to cope with the hot potato he had just been tossed. He thought about it, and after a moment delivered judgement: "Well, this is how it is. Some chaps fall in love with girls; and some chaps fall in love with other chaps. (pauses, blinks, smiles gently) And that's really all there is to say about it." The lesson moved on: I still think that, of all the things I recall teachers saying to roomfuls of boys during my time at KES, this was the wisest, the most humane and the most useful. A truly wonderful teacher. It was only through him that I came to understand the power of books to change and nurture a life. And, as I learned many years later, an exceptionally kind and courteous man who was always ready to meet old pupils - even one from the 1950s who was never going to be a star, but who has spent a lifetime trying to be a disciplined "AJT inspired" reader. He was one of those teachers liked by everybody of every age. I am sure that anyone who had the pleasure and privilege of being taught by him would agree that he was the quintessential mentor who enriched all of our lives as well as being kind, sympathetic and terrific company. Not the least of his achievements was to introduce a bunch of us to our first Chinese restaurant! Mr Trott was a very special person. He was the kind that gives adults a good name. I was saddened to hear of Tony Trott's death, although I knew he was ill. I left in 1977, and was taught by Tony. My parents were his colleagues (Tony was my father's best man) and I am Tony's godson. Mr T taught me for English A-level in 1961-3, when I did not distinguish myself particularly. But he did give me sound advice, warning me, half way through the two years and growing up, that my adulatory approach to literary criticism was not going to impress the examiners. I didn't act in school plays because I was in the school orchestra, and that was enough; but I remember going to watch the plays and thinking how good the choice of school play was, how ambitious, and how well acted by the boys under his direction. Descended as I am from a long line, on both sides, of schoolmasters, I know how important and valuable the continuity of service of scholars like AJT is, and am grateful to him. At the end of one autumn term, he went off somewhere on holiday, leaving his VW Beetle behind at school, parked somewhere near the Dining Hall. When we returned in January, we had had a very white Christmas. As a result, his car had disappeared under the snow, and all that anyone could see was a half-oval of glistening white. The next day he told us that he had gone to the car, scraped away some of the snow and got in. He then tried to start it, and it fired at the first attempt. He maintained that such behaviour was down to air-cooled engines! I have to say that at this distance it seemed a little unlikely, but everyone to whom I've related this tale has assured me that it is indeed very possible. Happy days! Sad news, but I have good memories of Tony Trott as he introduced me to Gerard Manley Hopkins and Louis Macneice. The latter was a lecturer at Birmingham University in the 1930s and I think refers to The Gun Barrels [pub] in his Autumn Journal, extracts from which Tony read to us. Not the least of Tony's achievements was his history of the school (No Place for Fop or Idler), in which his personality shines through. Although I was a classicist, not a student of English literature, I was a member of a class Tony taught: probably in my last year at KES, 1953-4, though it might have been a bit earlier. Alan Kirkby, who is still active, was in the same class. I also acted in two plays that Tony directed, Richard III and Murder in the Cathedral (I don't think there were any KEHS girls acting in the latter, by the way, though I could be wrong). We also often sat with him at lunch in the Dining Hall - occasions of lively discussion. I remember that he had a particular fondness for mediaeval literature, and also that he once told us that he had been to over thirty performances of The Marriage of Figaro, and that each time he found some nuance that had escaped him before. A curious quirk of memory also allows me to recall that he talked about his naval service during the war, when he had been stationed in Malta for a while. He described the Maltese language as a bizarre melding of Italian and Arabic, and gave us some examples of its strange orthography. He once invited some of us to the flat that at that stage he shared with Mr Bolton, a Classics master who taught me, and I remember that the conversation ranged around various subjects, including a report on Yugoslavia in one of the Sunday papers. I think his interests extended to the political, though I have no idea what his politics were. Many years later, on a visit to KES in the 1990s, I was able to talk with him again. It was not long after a memorial service for Canon Ronald Lunt in Birmingham Cathedral, which I attended. Somebody or other at the service had given a lengthy address that Tony described to me as "oleaginous" - a word that summed it up nicely. Tony's analytical dissection of the curious ways in which Ronald Lunt spoke English, on p. 109 of No Place for Fop or Idler, summons Lunt's voice back to me from the deepest recesses of my memory. Tony Trott was one of the best teachers I ever experienced. Although I taught at KES for a fairly short time (September 1982 - April 1986) I do have fond memories of Tony and remember him, both at KES and also, as a friend of Janet Cockin, adjudicating at Bromsgrove School where I taught from 1991. I thought of Tony only a few weeks ago when a former colleague told me he was going to teach English at KES and I immediately thought of the happy and legendary Tony Trott! It was not just the boys at KES that Tony made a big impression on but also me, a relatively inexperienced physics teacher learning his trade. Have just read with sadness about the passing of Mr Trott and would like to just pass on two memories of him which summarise his care and his communication skills. 1. It was winter and he was sitting as usual on the classroom radiator, wrapped in his gown, explaining to us that studying classic writings was like eating a good steak - "the more you chew it, the more juice comes out of it!" 2. In 1956 I was preparing for my three A-levels - French, Spanish and Music. The Chief Master called me into his office and advised me that Dr Willis Grant had informed him that "Harwood doesn't have a snowflake's chance in hell of passing A-level." Having received this news I went to see Mr Trott to ask whether he could help me cover the English A-level syllabus in six months. He said he could, and he did, and I passed, thus gaining my qualifications to move on to Birmingham University. I benefitted from some fine teachers at KES and he was right there at the top. Heaven is richer and we are poorer. I was so sorry to hear this sad news. He was someone we all regarded as a truly nice and authentic man. Tom's eulogy is spot-on. Thank you so much for this memoir of Tony Trott. He taught me in UMA and VA and I did not take his subject for A-level, but he was the most inspiring teacher I met at KES and easily (in my doubtless immature judgment) the man I would have most liked to become. I remember that production of Murder in the Cathedral. It was magical. And Tony teaching one of his favourite poets, Alexander Pope, was utterly memorable. Plus his reading of Chaucer in the original dialect was unforgettable. A lovely, lovely teacher. I can provide some clarification about Murder in the Cathedral. I was a member of the chorus in Tony Trott's production. I still have my copy of the play and of the programme. It must have been in 1954: there is no date on the programme but it does contain a list of previous productions and the last one listed is for 1953. The programme has the autographs of all the actors involved. There were no girls taking part. I don't know when KEHS girls were first involved in a production by Tony Trott, but I do know that about 1957 there was a semi-staged performance of Dylan Thomas's Under Milk Wood given in July by Sixth Formers after A-level exams. Some girls took part in this, although they were not all from KEHS: some were friends or relatives of the male actors. The play was not produced by Tony but by a KES boy; I think it was Nathan Joseph. But no doubt Tony Trott's approval for this revolutionary step was necessary. I wasn't taught by him (I left KES the year before Tony arrived there) but I knew him when I returned to teach at the school. Furthermore we shared one of the Foundation's properties, he and Doris in the upper flat and my wife and I in the lower. In those days (this would be in the early 60s) there was a great shortage of housing in Birmingham and the Foundation bought up older houses to let out to the staff. I imagine all those properties have been sold off by now. The two families had their first babies within weeks of each other and shared a washing machine to help with the nappies (no disposables in those days). We were godparents to Helen, their second child and we have kept in touch with Doris and Tony ever since. We visited them regularly in Kings Heath and had been planning to do so again shortly (we live in Banbury, only 40 min away by car). What sad news. Mr Trott was my form master in the Fifths and we spent most of our time discussing the ups and downs of the England cricket team. I was also present during one incident that contributed to his legendary status at KES. We had double English with him periods 7 and 8 and one afternoon he fell asleep; we all kept quiet for around half an hour till the end of day bell woke him up. Needless to say, the whole year knew about it within minutes of us leaving school. Fond memories of a great teacher and thoroughly nice man. He was my English teacher when I moved, fast-tracked, into Classical VA, one of just seven pupils who were not, in fact, studying the Classics. He was stern and testing but humorous and engaging. He inspired me about literature. I still recall the texts that he encouraged, but did not instruct, us to read: Lord of the Flies, The Power and the Glory, For Whom the Bell Tolls and so much more. We played football in his classroom, with a paper ball wrapped in sellotape, during break times, with lookouts in the corridor. But we also read the books that he encouraged us to read. At least I did, and I am forever grateful to him for that. I was already a pupil at King Edward's when Tony began teaching there. Over the following four years he had an enormous impact on me. He was a very remarkable teacher and human being. I left school in 1955 and from then onwards had very little direct contact with him. But I frequently received news about him from friends who continued to know him and in autumn 2000, I had the good fortune of sitting next to him at an OEs' reunion, and of being able to tell him what a very, very important person he had been in my life. Tony was by far the most significant schoolmaster at King Edward's from my own point of view. I am aware that he similarly, over his time at the School, was hugely influential in the lives of very many others. RIP, a great man. He used to cover my prep in red ink. That much I do remember. Tom's obituary captures the man very accurately. His humour, compassion and ability to give just the right support at the right time. Tony taught me on and off throughout my time at KES (1966-73), but was particularly important to me in my final term, when he gave me individual coaching and tuition for the Oxbridge entrance exam. His tremendous knowledge and love of literature, and the wise advice he gave me, helped me get an Exhibition at Selwyn College Cambridge, and set me up for a really enjoyable career. I haven't seen Tony since I left King Edward's in the year he retired. But I feel pretty emotional to hear the news. He was a wonderful man and very much loved. His personality, his humanity is at the heart of what was best about our school. Tom Hosty's obituary exactly matches the person I knew and who was for me a memorable and lasting influence on my studies. I am sure that it was thanks to him and Victor Biggs that I got to Cambridge, and the rest, for me at least, is history. I was one of his pupils from 1956-58 and, although my main A-levels were in other languages than English, I still remember the great impact he had on my appreciation of numerous English poets from Chaucer onwards. His standards were one of the excellences of school life. I wanted to study History for A-level in addition to French and German (I was a linguist) but History was over-subscribed and I was persuaded to study English instead, under Tony Trott. I never regretted it for a moment, as he was a really inspirational teacher and encouraged us to read outside the syllabus. I remember he drove a rather decrepit car, which he was entitled to park in a garage under the school for some reason. He used to regale us with tales of his life below decks in the Navy. Tom Hosty's obituary rightly highlights his humanity and sense of humour. As Hamlet said of his father, "He was a man, take him for all in all. I shall not look upon his like again." Tony Trott was indeed a great teacher, a great character and genuine human being! Tony also contributed to my development as a cricketer. In my first two years at school I had taken loads of wickets as a leg break bowler. By the time I got to the fourth year, school batsmen were capable of defending my good balls and were hitting my bad ones out of the park! In the school teams we had tended to get pigeonholed as either bowlers or batsmen, partly to make sure everyone got a go. Anyway, Tony encouraged me to develop my batting and (partly owing to a few words of his in the fourth year) I was opening the batting for the 1st XI by the time I was in the sixth form. Such a hugely influential and kindly man. Mr Trott was a wonderful teacher. He was brilliant in always making Shakespeare readings extremely interesting: one really looked forward to the next lesson. His control in the classroom was extraordinary: I'm sure he never had to raise his voice. One short, steady, wordless look in our direction would instantly bring us back from wherever we had momentarily chosen to be. But what I loved most about him was his tremendous enthusiasm to share with us whatever he himself enjoyed. One of the lessons which struck me as an even greater privilege than normal was on the occasion he wanted to read us the magical Middle English ballad 'The Three Ravens'. I was entranced by the experience and I'm sure the rest of the class must have been too. On another occasion he simply had to share with us the joy of a particularly hilarious chapter of Joseph Heller's Catch 22. I'm sure he'd only just discovered the book himself but, with not the slightest relevance to our A-level syllabus, he wanted us to experience what he had found so brilliant. Very sorry to hear of his passing. I read with considerable sadness and emotion the Obituary in The Telegraph. I was not taught by Tony Trott in class but I was involved backstage with each of his dramatic productions from 1952 to 1957, and those by other masters too: originally as a stage hand and later as Chief Electrician. Murder in the Cathedral was probably the first one of these. I am fairly sure that this was acted by boys only as the KE girls were not invited to join in productions during those years but did so later. However, several boys in the Upper Sixth Form put on a production in July (?) 1957 at the Birmingham Institute which did involve a few girls from next door! I cannot add much to the glowing tributes Tony rightly deserves. He was always kind, fair, tolerant and patient with all of us, and it was a great pleasure and privilege to have been involved with an outstanding teacher and producer. Tony is the shrewdest (and wittiest) observer of human nature, particularly extreme behaviour, I have ever met. He installed in me an appreciation of literature. Without Tony's guidance I would not have read English at University. I am forever in his debt for this. More obliquely, I have worked in 'interesting' countries at crucial stages of their development such as Argentina and Croatia. I often wondered what Tony would have made of the extremes of human behaviour I observed. Such thoughts may not have made me do my job better but it certainly made it more tolerable and, at times, entertaining. Although I singularly failed to distinguish myself in English Literature, achieving better results in French and Italian, I was fortunate enough to be directed by Tony Trott, first as Ariel in The Tempest, then as Lady Anne in Richard III, and as a Woman of Canterbury in Murder in the Cathedral. There were indeed no girls in these productions! (and I was to sink lower to Beggarwoman in The Threepenny Opera when I went up to Cambridge). In the sixth form, no doubt thanks once more to Tony Trott, we also had some most enjoyable evening Shakespeare read-throughs, and several evening excursions to Shakespeare productions at Stratford. 1. My very first year of teaching was 1970(! ), and was at KES. After some time, I asked Tony if he would observe one of my Shell English lessons (particularly as my second subject was Geography!). "No need, already done it. I looked through the window, and all the boys were sitting down." 2. In 1971 my younger brother Peter (1974) played cricket for Tony's U15 school team. He opened the batting with a certain J A Claughton, who on this occasion was facing the bowling. A delivery struck John on the pads, though well outside the stumps, at which the bowler turned to the umpire and yelled the obligatory request. Said umpire was Tony, perched on his shooting stick, and fast asleep. He awoke with a start, and immediately gave John out. The future Chief Master of KES was not well pleased! 3. Cricket again! Malvern College advertised for Head of PE, and I was interested, so Tony suggested I accompanied him and his U15 cricket team, which had a mid-week fixture there, and had a clandestine look around. Having looked, I came to watch the match. The Malvern master was umpiring at the bowler's end, duly called "Over"' and everyone moved - except the square leg umpire, Tony, who was asleep whilst sitting on his shooting stick. We were studying 'The Love Song of J. Alfred Prufrock', and came to the line: "I have measured out my life with coffee spoons." "Not bloody great ladles!" said Mr Trott. My recollections of Mr Trott go back to his early years at KES. He was our English Literature master when I was in the Lower Geography Sixth, or a year earlier in Lower Division A. In those early days he was given the nickname "Piggy Trott", which I thought was pretty unkind. One of the periods when he taught us was the last one on a Monday afternoon, during which we were tasked to read aloud around the class Pride and Prejudice. On one of these occasions there was, what I recall, a spontaneous conspiracy for us to read progressively more quietly with the intention of lulling him off to sleep - and it succeeded. I also recall attending an informal concert in one of the Geography classrooms when he sang excerpts from Gilbert and Sullivan operettas to the delight of the assembled audience. On a very different occasion I met him in the restaurant car of a late evening train returning from Paddington to Snow Hill. At the time I had a temporary pre-Christmas job as a courier for a London trade and technical magazine publisher with printers and process engravers in Birmingham. This would have been in the early 1950s. As soon as he saw me he invited me to sit with him and so have dinner together. At the time, and indeed ever since, I have thought that this was remarkably gracious of him. In my experience, kindness and graciousness typified the man. This is how I remember him. I had the privilege of working under Piggy's tutelage (I'm pretty sure Tony knew and secretly chuckled at his sobriquet) for quite a few years in the mid 1950s. Tony somehow managed to steer this reluctant sailor past both Charybdis and Scylla on my rocky voyage through O then A-level English. En voyage, he somehow persuaded me to take on the unlikely role of Lady Macbeth in a class reading of the damned play. I can still to this day recall the smiles about my "withered dugs" - little did I expect that this prediction might one day ring true. Thank you Tony for introducing me to 1984, Brave New World and perhaps most memorably, The Lord of the Rings. You were also instrumental in opening my eyes and ears to the subtle blandishments of the advertisers - thanks to you, the Hidden Persuaders had an uphill task to reach the hearts and souls of many fellow Edwardians. Vale Tony Trott. You are constantly present, but missed nonetheless. I looked forward to English lessons with Tony Trott for two reasons. First, they were always interesting, and secondly there was generally something to have a laugh about. I kept in touch spasmodically after I left school, and I know that he was quite touched when I came into KES when he retired and gave him a bottle of Scotch! If asked who was the greatest genius who ever lived, he would probably have said Mozart. He was the most widely read and cultured man I have ever known. Of all the colleagues I worked with during my time at KES, Tony was not only an exceptionally gifted teacher but he was also a warm human being, affable, unassuming, altruistic and with an infectious sense of humour. We corresponded regularly and enjoyably until these last few weeks. He much enjoyed the heading I sent him from the sports page of The Manchester Evening News not long ago. Its heading was "Trott gets the runs"
"Tony," I asked. "What have you been eating?" Lovely man, God bless him. In the Sixth Form, three of us (I won't identify the others) started a collaborative work that could only be described as adult material written by adolescents based on the implausible sexual exploits of a youth called Cyril. I carelessly left the exercise book containing the early, and only chapters, in Tony Trott's classroom. A day or two later he approached me with the book in his hand. I was nervous and embarrassed. "Most entertaining dear boy, careful where you leave it next time..." was all he said as he handed it back to me. While at university I engaged in some high jinx which (details omitted) landed me in hospital. Nothing too serious in the grand scheme of things, and, in conversation with my doctor, I found we had both been to KES. It almost goes without saying that Mr Trott was the only teacher we had in common, whom came quickly to mind, and we had nothing but great things to say about. My fondest memory of my English lessons were when we were studying a Midsummer Night's Dream. Tony rather absent-mindedly thought about the lesson and came out with "Dream... Dream, Dream" which was followed instantly by, as if rehearsed, the whole of 5T in a single voice singing some acapella Everly Brothers (which probably prompted a "Lord what fools these mortals be" at the very least). Contributors here have rightly praised Tony Trott's inspirational teaching, but another aspect of his formidable talent was 'pastoral care' (as it wasn't then called). His steely patience and practical concern saved more than one troubled teenager (including me) from disaster, and above all, as my form master, he motivated me to inquire and to read, not merely assiduously but with insight. Taken together his remarkable qualities laid the foundations for the whole of my ensuing career, rising to the top rank of the Cambridge University administration, a Fellowship, and finally speechwriting at Westminster. In essence all these occupations depended on being a wordsmith, an attribute he cultivated. Then there was the school stage, and Tony's masterly series of productions, beginning for me with Coriolanus, in which I participated, ultimately as a stage manager: this too led on to fortune, or at least occupation, in the chairmanship of several theatre companies. In later years Tony and Doris regularly visited Cambridge, and there were also convivial gatherings in Birmingham until quite recently. The defining quality of these encounters was that they were above all fun: laughter was never far away and to my undying gratitude for his teaching are added fond memories of his humour and uncanny skill as a mimic. For all this and much more, thank you Tony. I was in upper 5A in 1950 when Tony Trott arrived at KES. German and French were my main subjects, but Tony, knowing me from English lessons, found out that I was going to Trinity Hall, Cambridge for scholarship exams. He thought I might find that quite challenging - eating out was not part of the culture where I came from. I had only ever been out for a meal to the wartime 'British Restaurant'! In order for me to experience at least one civilized conversation over a social meal, before Cambridge he invited me to dine with him one evening at the Burlington Restaurant in Birmingham. I remember little about the meal apart from the exceptional thoughtfulness of the gesture - plus the fact that it didn't produce a 'result' at Trinity Hall! Some sixty years later I met Tony in King's Heath by accident. He remembered me immediately, including some details of my career, and also the evening at the Burlington. I hope that wasn't because he got into trouble over it! How reassuring now to look back on his generous invitation in these days of such obsession with safeguarding issues! Tony Trott was a major influence on my knowledge of and taste for English Literature. The phrase ‘inspirational teacher' is often used to identify teachers crucial for one's development. Tony was certainly inspirational I was fortunate to have him as a Form Master two years running, because I did badly in the mock O-levels and had to take the Fifth Form studies again. He was a brilliant teacher of English, and was very effective both as a ‘close reader' and as someone with broad approach and a commitment to Literature as a key component in social awareness. I suppose at some level he was a Leavisite, but I don't recall him mentioning Leavis or his ideas. He took us through King Lear in great detail, and what understanding I have of that play is largely because of his instruction. Tony was equally excellent when it came to Jane Austen, and my enthusiasm for this novelist was initially generated by him. Sense and Sensibility was the set text, and he gave us an insightful introduction to eighteenth-century notions of sensibility. He introduced us to Louis MacNeice, who became my favourite contemporary poet, largely because he was the laureate of Birmingham. He speaks of the "noble curve" of the Galloway Building at the top of New Street, long since gone, and replaced with what was for a time the Floosie in the Jacuzzi - although the fountain, which sprung a leak, was then filled with dirt and floral tributes. And I vividly remember the little impromptu pantomime he performed for the line "Nor I half turn to get yet turning stay." He made it into a complete nonsense, and planted life-long reservations about Christina Rossetti in my mind. And perhaps the minds of my contemporaries. So a good job there were not too many such performances. The centre of gravity of Tony's taste was Alexander Pope, and he inculcated a life-long love of the poet for us. He made us go away and produce heroic couplets. Not as good as Pope's, needless to say. I suppose in many contemporary schools Alexander Pope is not even a name. Not the current KES, I hope. Tony was always encouraging to the boys, and was a very diligent marker of essays. I recall that I once spelled caricature as charicature, and he explained that I was guilty of one-boy folk etymology, so that correcting spelling was not a matter of intimidation and humiliation by the powers that be, as the villains of liberalism have put it, but a further exercise in education. He once said it impossible to write a piece in which every sentence had no main verb. I went away and wrote such a piece, and he was much amused, and read some of it out in the class. They alighted out of the coach, and went into a poor woman's house at the bottom of Highgate Hill, and bought a hen, and made the woman gut it, and then stuffed the body with snow, and my lord did help to do it himself. I forget how Bacon came up - probably in connection with Tony's scepticism that Bacon had written the works of Shakespeare. Still, he did invent frozen food - although Tony might correct me at this point and say "discover" - were he here. He remains one of the ‘readers over my shoulder' - something every writer should have, if he or she is to keep on the straight and narrow. Tony introduced us to comic poems by Father John Forrest - mainly on church matters. One was about blue dome worshippers - who spent time out of doors on Sundays, with sky and mountains, rather than going to church. Another began "The Vicar won't christen our baby." I can't remember how it went exactly, but it ended "There's plenty of others that will." I suppose this made no contribution to A-levels, but it kept us amused. It was actually doggerel, or, rather, dog-collarel. "Let me introduce the topic, Handel, by mentioning that in London it is not the custom to put the knife in the mouth - for fear of accidents - and that while the fork is reserved for that use, it is not put further in than necessary. It is scarcely worth mentioning, only it's as well to do as other people do. Also, the spoon is not generally used over-hand, but under. This has two advantages. You get at your mouth better (which after all is the object), and you save a good deal of the attitude of opening oysters, on the part of the right elbow." And a very effective lesson from A.H. too, better than if had yelled down the table, "For God's sake don't do that Richards you stupid boy!" Still, it could have been worse; I could have picked up the dish and licked it clean. When one sees children of our time holding cutlery like chimpanzees at a tea party, and they nearly all do, one reflects that a spot of A.H. redivivus might be no bad thing - always assuming his subtlety would get through. Tony introduced us to advanced developments in the gustatory and culinary department by taking us to a coffee bar in a cinema on the Bristol Road (where the extraordinary novelty the cappuccino was served, produced by a machine that sounded like a geyser in overdrive) and a Chinese restaurant near Horsefair at the end of Suffolk Street (an area of Birmingham now utterly obliterated and devastated by the votaries of improvement). This was the first Chinese meal I had. It was something like greasy seaweed. Tony also invited some of us to his house for dinner. His wife Doris was a charming and welcoming host. I wish I could remember what we talked about. She served us a cantaloupe melon, the first time I ate one. The VA form room next to the Art Department had a large puppet theatre at the back, which was never used in my time. Tony said that he had once seen a performance in it, but the strings were all too short, so all the characters performed about six inches above ground-level. And since the manipulators weren't terribly proficient all the puppets' movements were in the crouching position. When I was in the Fifth Form G.J. Turner (there were three Turners: G.J., A.A. and E.K.) set about organising a fund to pay for a leaving present for the history master Patrick Hutton. Since there was a famous cricketer named Len Hutton, this master was inevitably known as Len. The fund was called VALF: V A Len Fund, and a collection was made each week. G.J. chalked on the blackboard ‘VALF has six weeks to go', etc. Tony was much puzzled by the mystic initials, and I'm not sure he ever cracked the code at the time. I was in G.J. 's bad books, because I refused to contribute to the fund. Not that I disliked Patrick Hutton, quite the contrary, but I objected to the fact that the fund had been set in motion with no democratic discussion about all the details. When G.J. gave Patrick the present he pointed out that my name was not on the list of contributors. I discovered later that Patrick rather admired my strength of mind. Which took the wind out of the sails of G.J. slightly. While we are on the subject of initials it is worth recalling that the teachers were always keen on mnemonics. This was in the days when information retrieval was performed by the human brain rather than by machines. Tony's mnemonic was SIFT - the words used to assess a text: sense, intention, feeling tone. This was also before the notion of an author's ‘intention' was ruled out of court by the tenured mandarins. The Geography Department produced SUNWAC: Swale, Ure, Nidd, Wharfe, Aire and Calder - the names of Yorkshire rivers from north to south. Alas, did not come up when I was on University Challenge. Tony could be quite strict and firm sometimes. I recall one hot summer day when we wanted to take off our blazers. Request refused: "The British Empire was won on dinner jackets." "Lost on them too, sir," came a voice from the back. Tony loved the theatre, and put on various productions, including an excellent Coriolanus with Martin Swales as the hero's mother. A formidable lady. A production of Under Milk Wood was under his aegis - the only time I have ever seen it on stage. He took part in Peter Ustinov's Romanoff and Juliet, and was obviously a born actor. I still remember his adroit and delighted performance of the line "they know you know they know you know..." This must have been about 1957, and the play was new as recently as April 1956, so I suppose it was what would be now be called ‘cutting edge' - although the phrase was not available then. Dreadful to think that my memory of this is now sixty years old! The play was performed on the stage of Big School - no elaborate up-to-the-mark Arts Centre then. R.G. Lunt's wife Veslemoy took part. The unfailingly reliable Robert Darlaston kept the programme, which tells us that the set was designed by Bruce Hurn and built by Keith Hall. Keith requires an essay to himself, but that will have to be for another time. Tony took a party of boys to see George Colman and David Garrick's The Clandestine Marriage at Birmingham Rep. I didn't go, but learnt that he was embarrassed by the spectacular décolletage in the production. The internet is a marvellous but also dispiriting thing: a click or two of the mouse reveals that it appeared 1 February to 17 March 1956, and that a programme and photographs are available in the Britten-Pears archive, since Gladys Parr played Mrs Heidelberg. It's impossible any longer to appear well-informed or to enjoy the kudos formerly earned by coal-face research. I was present though when Tony organised a trip to Stratford to see Pericles - the first Shakespeare I saw at the RSC. This was a golden age for Shakespeare productions at Stratford. Tony took us through poems learnt off by heart for various competitions. I recall that one piece was an extract from Tennyson's Ulysses: "There lies the port;, the vessel puffs her sail: / There gloom the dark broad seas." Etc. Another sixty-year old memory, and word-perfect. Tony published an edition of Pope's Epistles and Satires (Macmillan 1961) with his colleague Martin Axford. Martin, incidentally, told us off vigorously in the first week of sixth-form work for thoroughly inadequate performances. We didn't dare do that badly again. Tony published poems, with Lionel Adey and John Ferns in Affirmations (1989). And he wrote the history of the school: No place for fop or idler (1992). When the Queen visited the school in 1955 there was some sort of hitch, which I didn't see. Tony wrote a little poem, which I can't fully remember. "The Queen dropped in today, just as she was passing, di di dum di dum... And found us all arsing." I wonder if it survives in the archives? Some years later David Winkley and I organised a dinner party for Tony at a stately home in the suburbs. It was a great occasion. We clubbed together to buy Tony a boxed set of Wagner. He thanked us, and said he was going to go away to listen to the whole lot, "to find out exactly why it is that I don't like Wagner." In his speech of thanks Tony recalled some of his pupils, including E.K. Turner who, alas committed suicide. E.K. was very musical and very highly strung. I used to tease him by saying I quite liked Eric Coates. "Eric Coates! Eric Coates!" he would fulminate, almost literally frothing at the mouth. I feel sorry in retrospect, since this was a form of bullying. I have been punished since, though, by often switching on Radio Three, of all places, and hearing the dire Eric Coates. It's a black mark against Elgar that he quite liked Eric Coates. E.K. 's musical tastes were very austere, but he did make the concession of reluctantly admitting that Grieg's Piano Concerto was "a work of genius". Robin Duval (Dieuvaaaaal R.G. Lunt called him) said how curious it was that he had to make the concession with reluctance. It was because of Tony, principally, that so many of us got into Oxford and Cambridge colleges. He obviously belonged to a previous age, since I remember him telling us that he hated receiving typed letters. He could easily have been a university teacher, and, indeed, he was one of the candidates for the post at Swansea that Kingers got. We were lucky to have him. And he put me on the broad highway that, ultimately, led to a Fellowship in English Literature at Brasenose College, Oxford. His approach to literature was not doctrinaire, and he never preached, but as the months glided by we were subtly imbued with a sense that it mattered, helped to shape society and individuals, and was not just exam fodder. I suppose when one talks about ‘inspirational teachers' this is the key thing: that they project a sense that their subject matters. There is a short film of Tony teaching which one can see on the internet, shot by Dancy Lange in the 'seventies, when the boys had much longer hair than we were allowed. It is thoroughly disappointing, since Tony is not delivering original and picturesque ideas, and it doesn't capture his sparkle. He is simply throwing exercise books across the class and telling them they haven't done very well with the assignment, and it might be his fault. I was waiting for the latest candidate to be proposed as "an okay boy", but, alas, it didn't come. I was delighted to see Roger Wilkin's photo of Tony going out to bat with Peter B (Beresford) Rothwell on the London Kestrels tour some time in the late 1950s. It reminded me of Tony's classical batting style, in the mould of P B H May perhaps - very correct but rich with style. In the Staff vs the X1 annual fixture there would be the clash of contrasting styles between Bernard Guy the captain with his aggressive, bludgeong approach to batting and Tony's classical model of stroking the red ball gracefully. In the match Tony would always produce the near perfect cover drive which would prompt Dudley Cockell the school coach to say, sotto voce as umpire with his strong Cornish accent, "you don't see many cover drives like that these days". That was Tony, a man of great self discipline, hardworking, demanding of others but always striving for perfection. He had what the current French rugby team strive to rediscover, élan. He also taught me to read, write, and understand my mother language when illiteracy and the News of the World clichés were taking over. 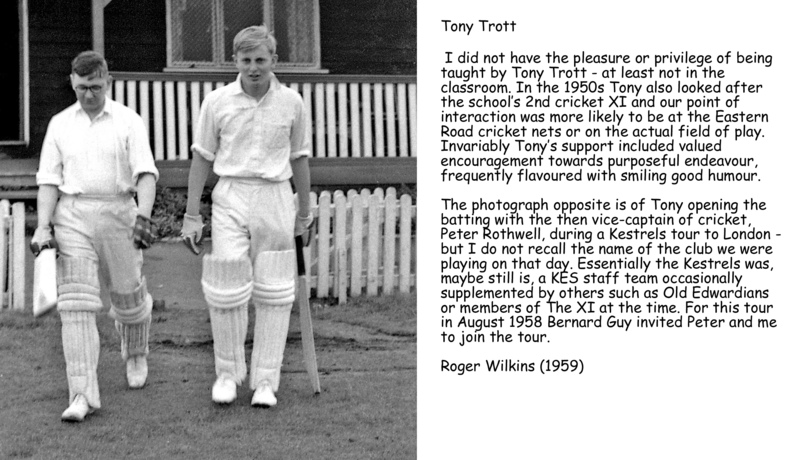 I was a pupil of Tony Trott from 1955-60. He was the best teacher I ever had, and like a second father to me. After my second year in VA, struggling to raise my essay mark from 8/20 to 16/20, and following unimpressive O-level results, my father (bless him) wanted to take me out of school, and put me in the Merchant navy. The Chief Master must have consulted Tony, who thought I should have a third chance. I couldn't be more grateful to him. Tony Trott seemed to me the complete teacher - kind but firm. He had standards. He was also an accomplished writer. His memoir of his naval service in Malta, Get to Sea, Jack, is wonderfully amusing, as is his history of the school. His dozen poems in Affirmations (Ottawa: Borealis Press, 1989) are excellent and moving. King Edward's is blessed to have had a senior English master who served the School with such distinction from 1950 to 1987 - a wonderful teacher: a man of complete integrity. I have one particular memory of Tony Trott which has always stuck in my memory. lt was during an English Language lesson when l was in Rem. A, which would have been in 1950/51, and we were concentrating on punctuation. One of my classmates was called Pickworth (l can't remember his first name) and at one point Mr Trott addressed him thus: "Pick me out a preposition, Pickworth". Poor Pickworth was somewhat taken aback by this demand but another member of the class quickly came out with the riposte "Oh, he's trotting them out today", which produced much laughter!